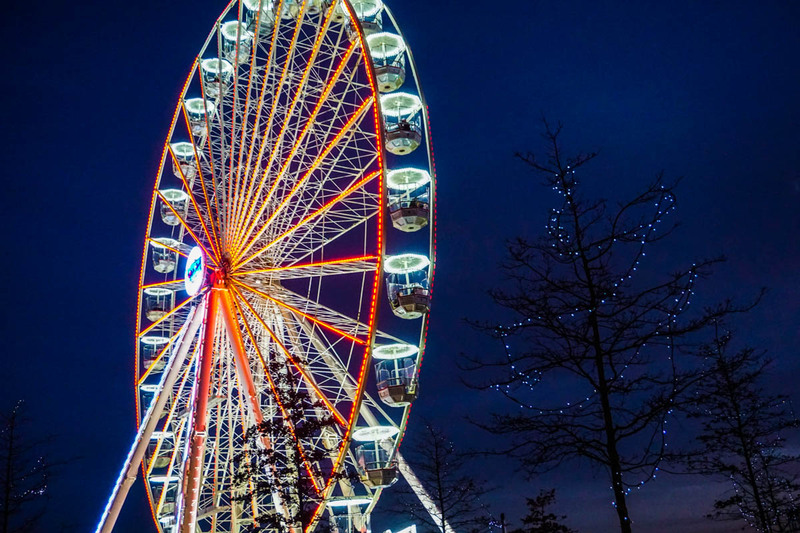 Birmingham is a fun city with plenty to do, great shopping, top restaurants and a buzzing nightlife… so why don’t more people visit? I spent a few VERY happy years living in Birmingham between 2004 – 2007. 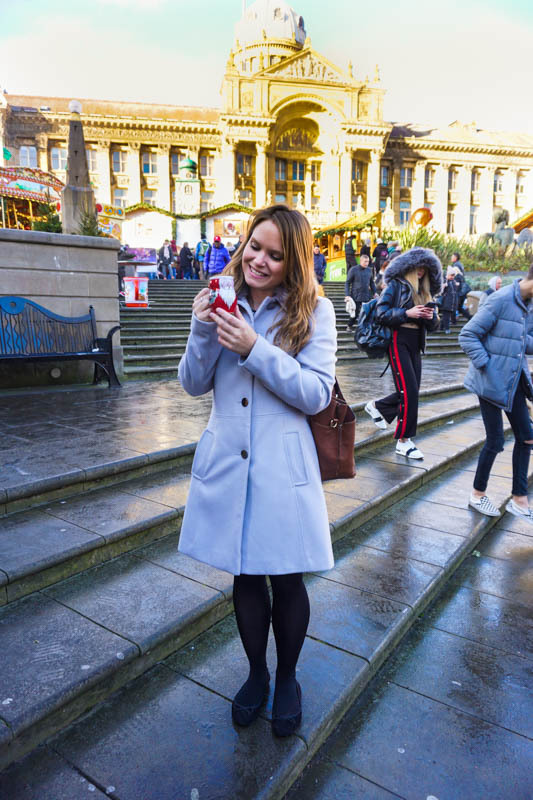 I spent my days on campus at Birmingham University and interning at local radio stations, my nights letting loose at the city’s bars and clubs, and my weekends shopping at the Bullring. For some reason though, Birmingham has always had one of ‘those’ reputations. It’s such a fun city, yet not an obvious city break. It’s got absolutely loads of great restaurants (including numerous top curry houses), yet doesn’t seem to have earned a reputation as a foodie city. 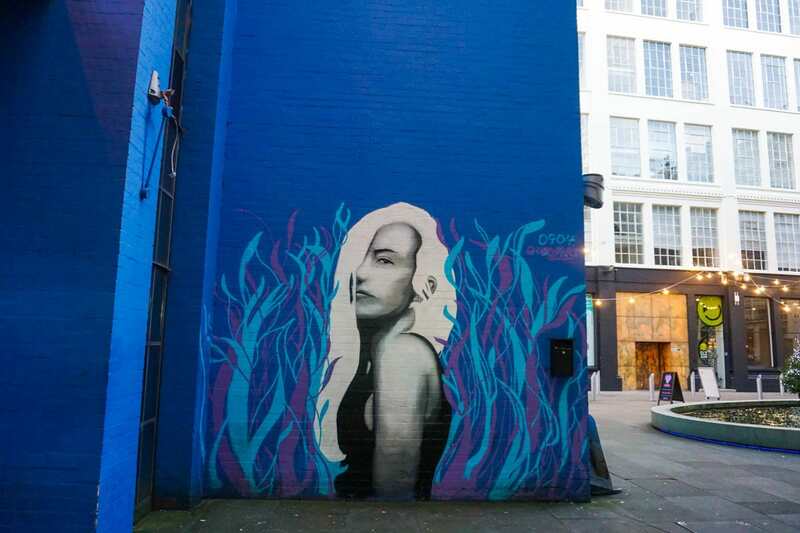 It’s super creative, with arty/hipster areas like Digbeth and top theatre, art, dance and music in the centre. 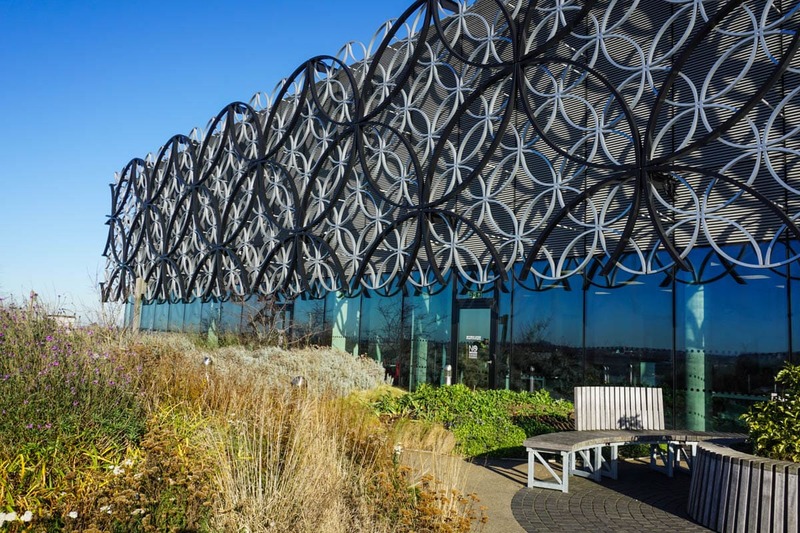 Plus there’s the futuristic architecture of the Birmingham Library, The Cube and Grand Central… yet London overshadows it in terms of weird and wonderful buildings. 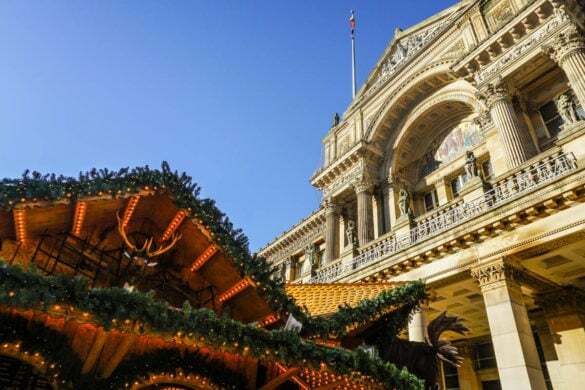 And as for Christmas, this is a city which takes festivities extremely seriously! But I believe in Birmingham! It’s underrated but we Brits love an underdog. 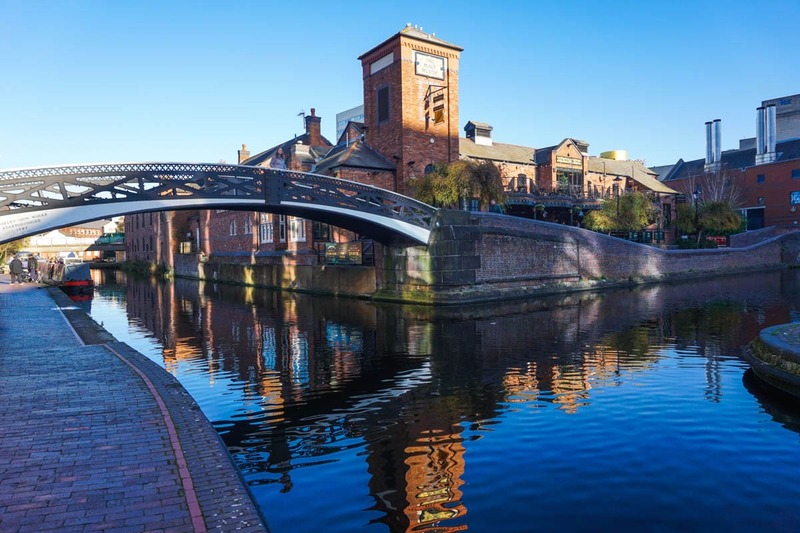 So without further ado, as part of my time as a Visit England ambassadorship, it’s time to show you why you should consider Birmingham… no, seriously. Birmingham is home to the largest authentic German Christmas Market outside of… Germany! From mid-November onwards, the whole city is a vision of twinkly lights with the delicious scents of glühwein and hot dogs and a festive soundtrack jingling away. 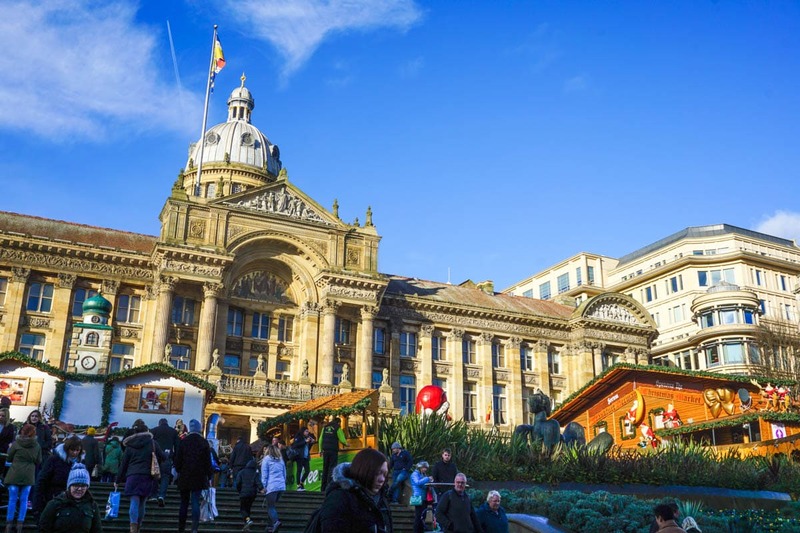 The setting is lovely too, with the cute wooden huts in front of the Birmingham Museum and Art Gallery in Chamberlain Square. No doubt due to the construction work going on around Centenary Square, the ice rink and ferris wheel are now down by East Side Green. 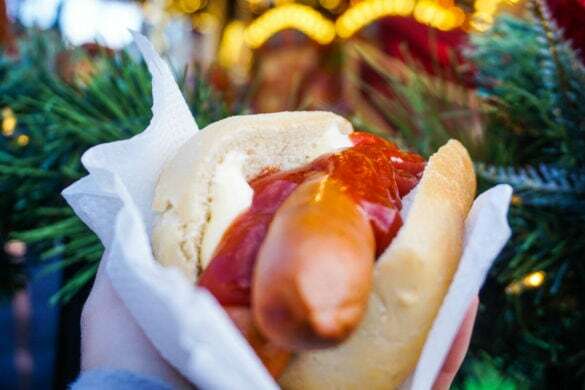 A slight contrast to the German Market, this area has a small funfair with dodgems, a couple of small kids rides, a big spinny-dangly-throw-up-your-lunch ride for thrill seekers, and a rollercoaster. There’s a covered ice rink with plenty of viewpoints around the edge. While in my head I imagine my Torvill and Dean moves, I’ve discovered over time I’m much better at watching with a drink in my hand! 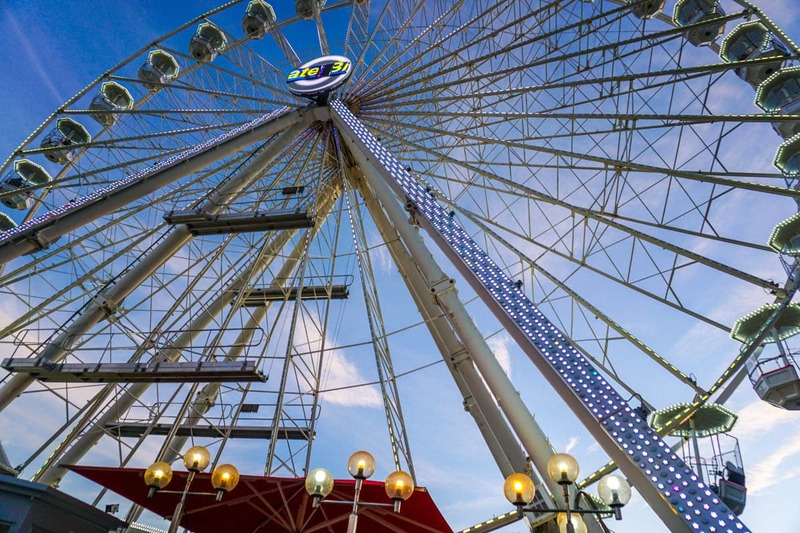 The starring feature has to be the huge illuminated ferris wheel. It’s absolutely stunning with it’s cute little cabins hanging off it. Wrap up in a warm coat, bobble hat and gloves, and set off at sunset for the best views – I loved it! The best brunch in Birmingham… and do you know what, that’s not just according to me! 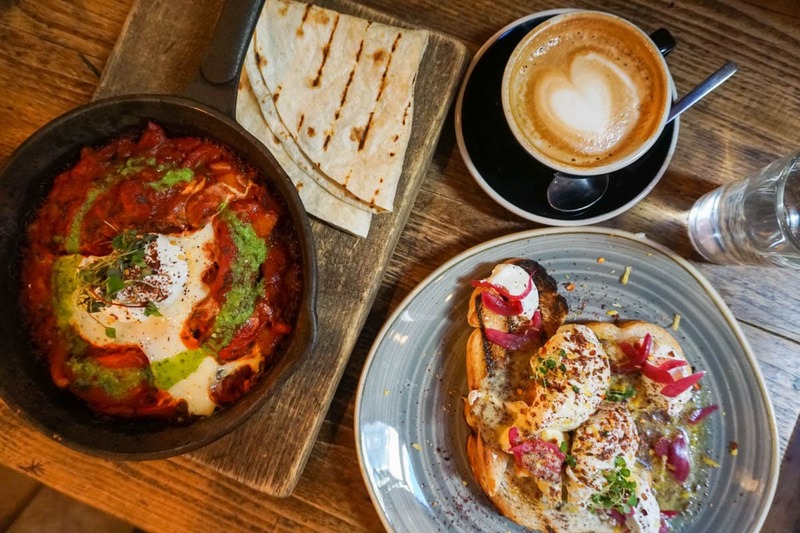 This award-winning café serves delicious pans of shakshuka and a new fave of mine – Arabian buttered eggs. They are to die for. Food is flavoursome, creative, well presented and the coffee is strong (and roasted on site). 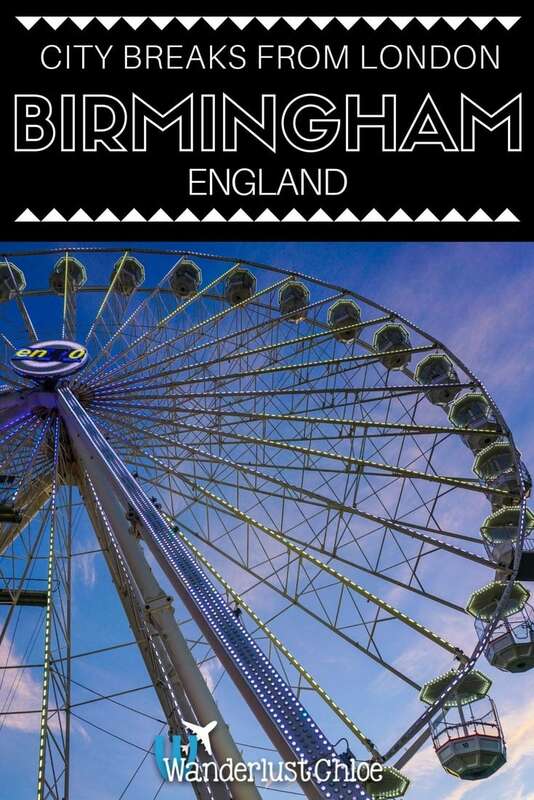 It’s a must-visit if you’re heading to Brum soon. While at some points of this trip I was floating around in a nostalgic haze from my university days, at other moments I was amazed at how far the city had come in ten years. 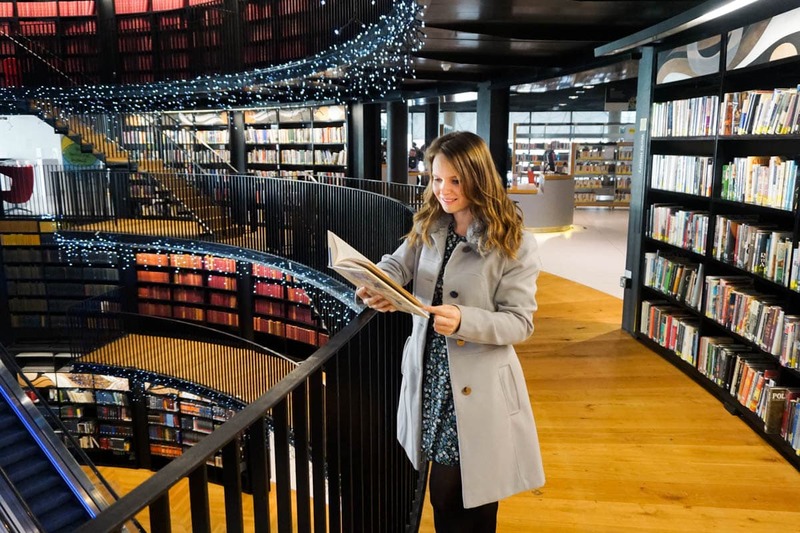 This fabulous modern library is a new addition to the city (replacing the Central Library) and while it’s a fantastic resource, it’s also a wonderful place to get lost in a book or relax. I loved the outside terraces, which include a secret garden on floor 7. Birmingham’s reputation for curry precedes it. 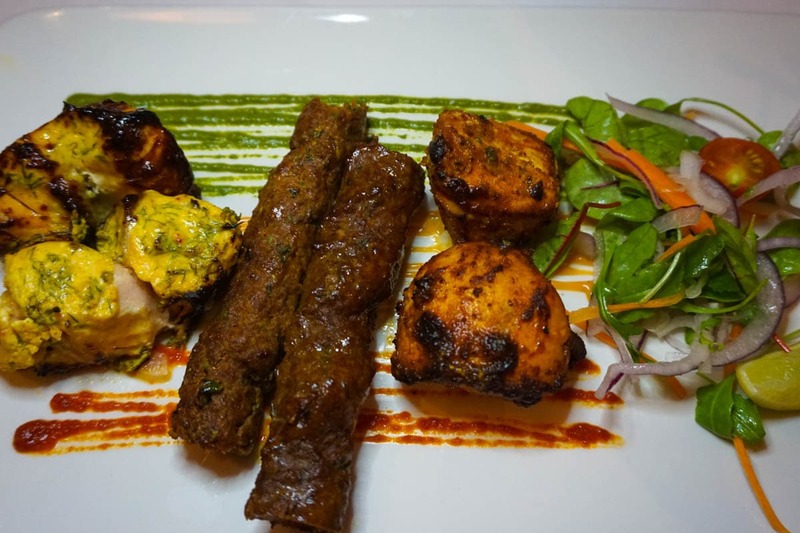 While many of the top restaurants are local eateries in the city’s suburbs, Pushkar is flying the flag for exceptional food right in the heart of the city. 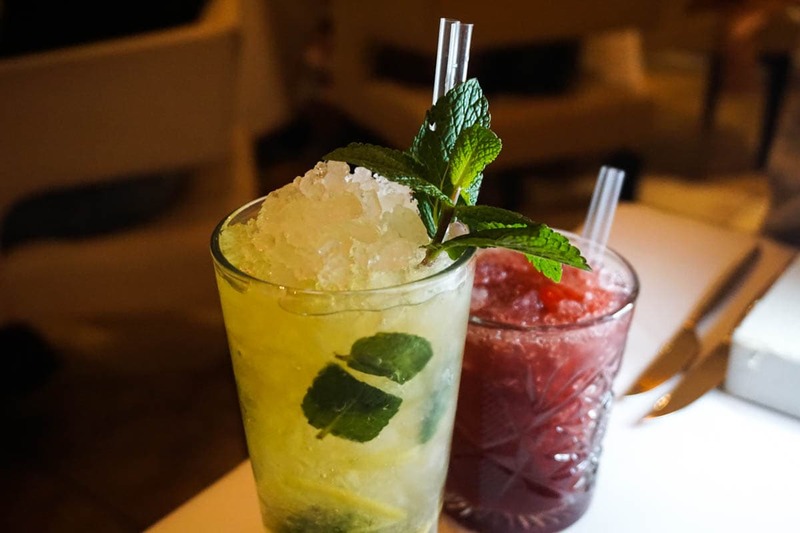 Located on Broad Street (the area best known for nightlife) it’s a smart restaurant and bar serving refined but flavoursome food and an extensive menu of seriously good cocktails. The menu was interesting, with twists on many of the classics. 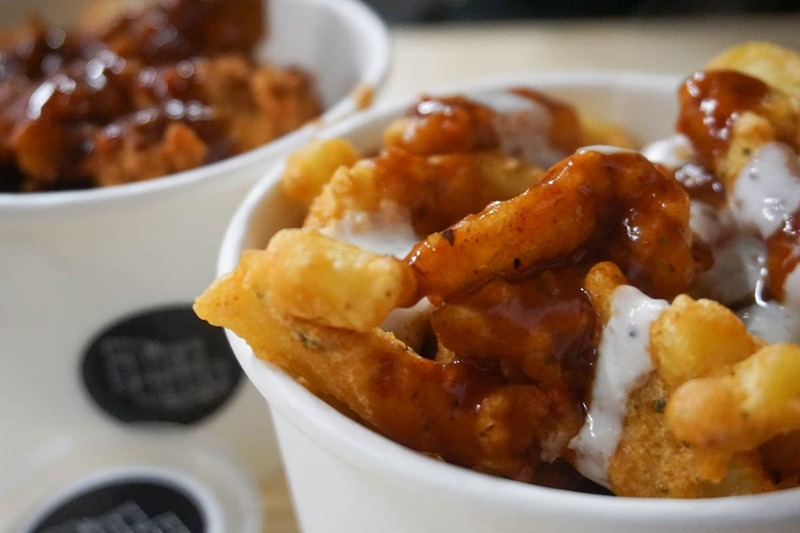 Their kebabs were excellent and absolutely packed with flavour, the murgh tikka masala was a refreshing (and spicy) change from the bright orange chicken tikka masala we’ve grown used to, and the sauce of the lamb rogan josh was blended to perfection with warming, tangy, spices. The cocktails are a reason to visit alone, with a special mention for the refreshing ginger mojito, which worked so well with the meal. Service was also super friendly, in that undeniably Brummy way! I’ve grown used to the trend for street food pop ups in London, but they’re not so common outside the city. Digbeth Dining Club is certainly drawing crowds at weekends. 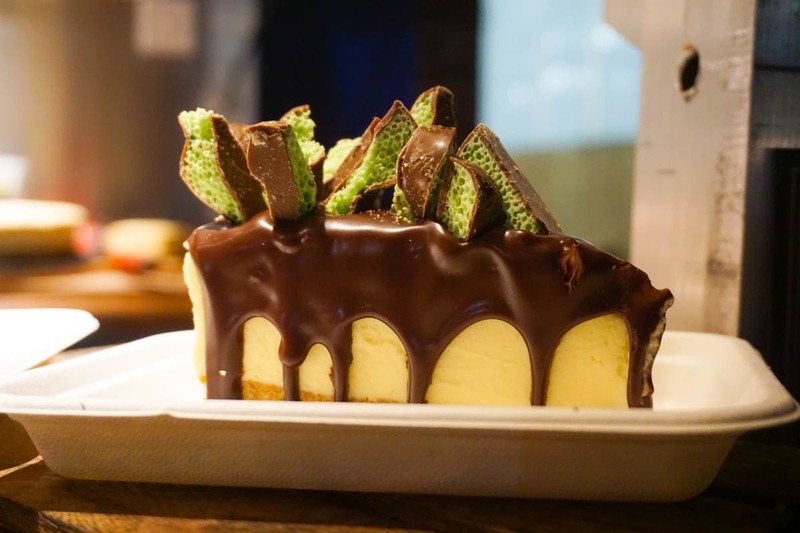 Running on Fridays and Saturdays, food options include tasty burgers, tacos, posh mac and cheese, spicy indian snacks, wood fired pizzas, and even indulgent cheesecakes. With a few bars part of the fun, you could spend a whole evening enjoying drinks and snacks while enjoying music by the resident DJs. I’ve heard the burgers from Flying Cows is one of the most popular offerings – you’ll know which one it is by the long queue or the sold out sign! 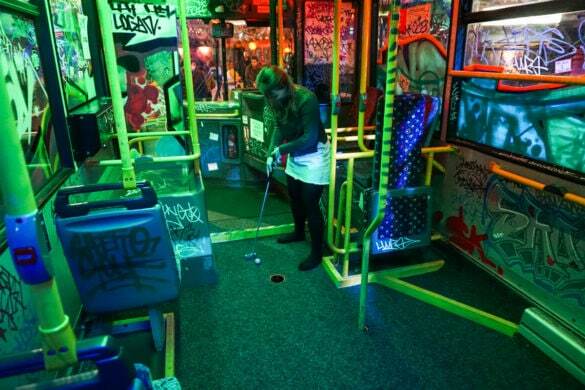 There’s another reason to visit Digbeth – to play Ghetto Golf! Genuinely, one of the most fun experiences I’ve had on my travels recently, I loved this place. After walking through a graffitied warehouse door, you enter into a UV, colourful, bar and golf area, with a school bus parked in the middle of the room and several themed-areas around the space. 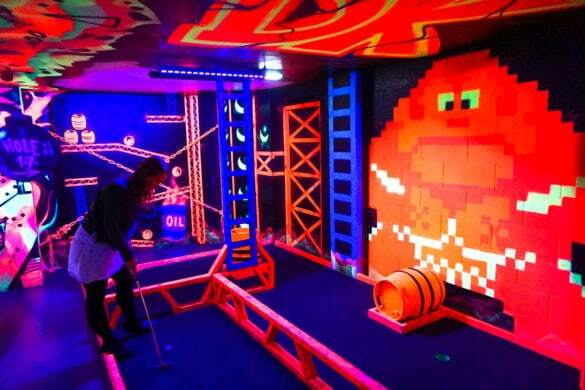 The 18-hole course takes you through an old fashioned English boozer, a retro living room, a wonky school bus, a Blockbuster video rental store and ends in a UV video game. While it may bring out your competitive spirit, it’s such a good laugh, and something I’d definitely recommend booking in advance! When I was at uni in Birmingham, the Custard Factory was known as the arty, creative part of the city. If we had hipsters back then, this is where they would have hung out… and sure enough, that hasn’t changed. 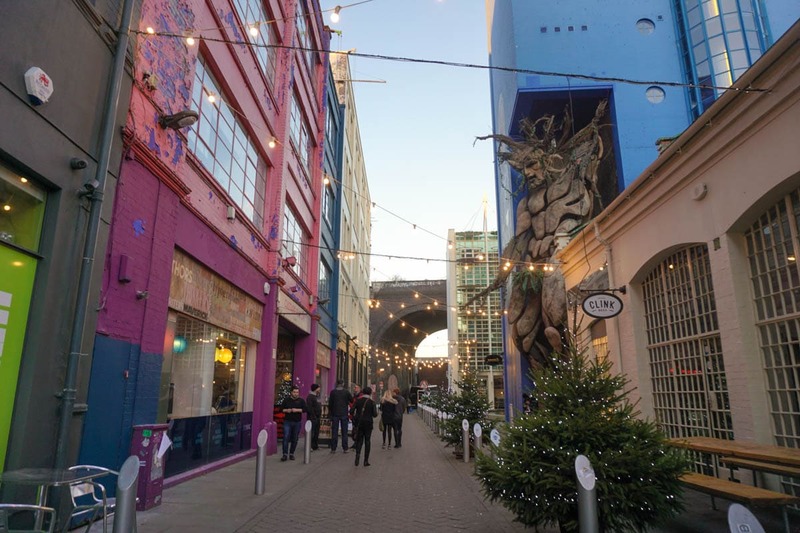 Once the Birds Custard Factory, it’s home to an eclectic mix of shops (I spotted a vintage store, jewellery shop, skate store and a few others) plus a funky cinema with bar, a craft beer bar and a funky looking barbers. 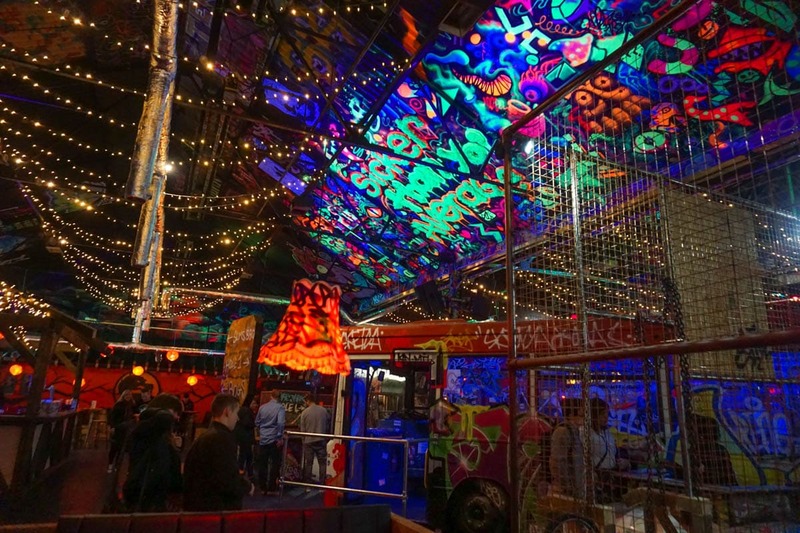 It’s colourful, and home to some amazing pieces of street art. 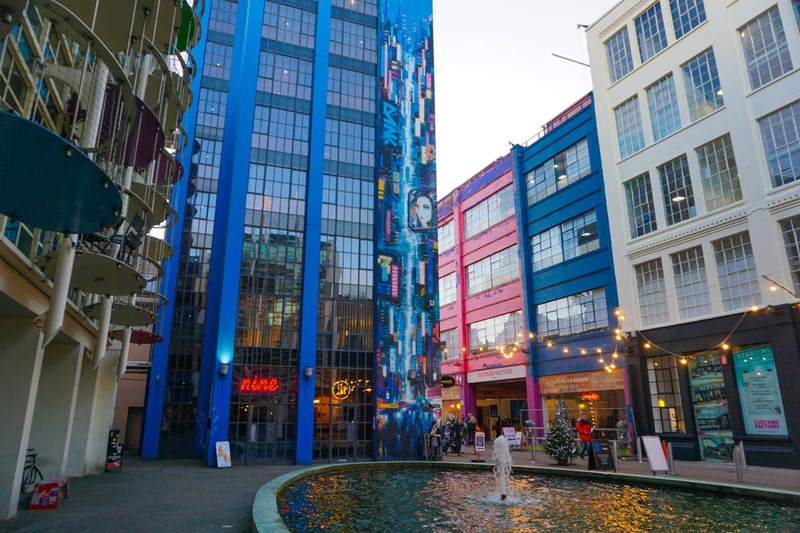 In fact if you’re into art, don’t miss a trip to the car park opposite – it was like Brum’s very own answer to Miami’s Wynwood Walls – an open air art gallery. The shopping in Birmingham is still as good as ever. 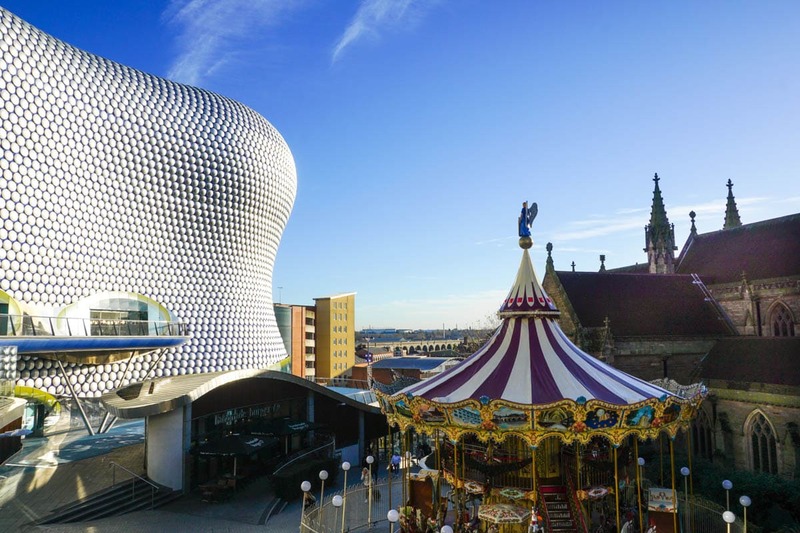 While there are some cute independent stores around the city, The Bullring is the place for a solid day of chain stores and big name brands all under one roof. 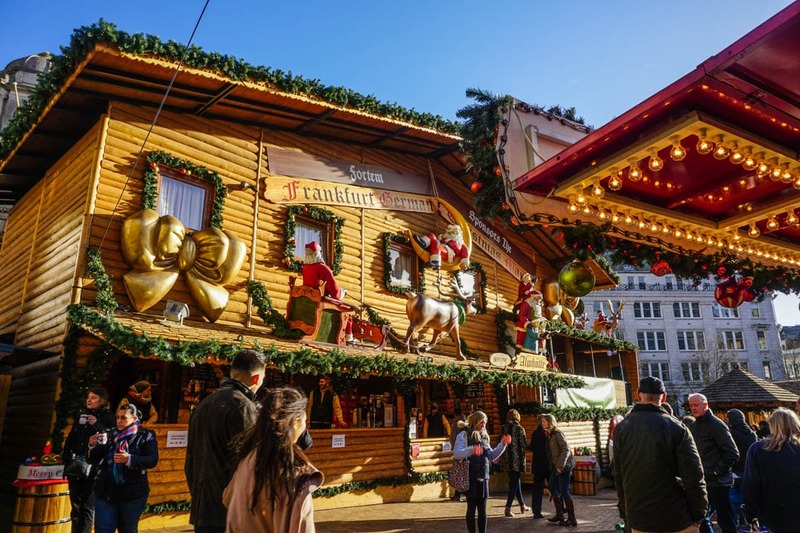 Check out the super long opening hours in the run up to Christmas if you’re planning a festive break. One of the most reasonable gourmet meals I’ve ever eaten. While I expect prices to more reasonable outside of London, I couldn’t believe a three-course lunch at Bistrot Pierre came to at £13.95. After a tasty starter of roasted peppers and goat’s cheese, I enjoyed a delicious Mediterranean cod dish, followed by a sweet but tangy rhubarb and apple crumble. 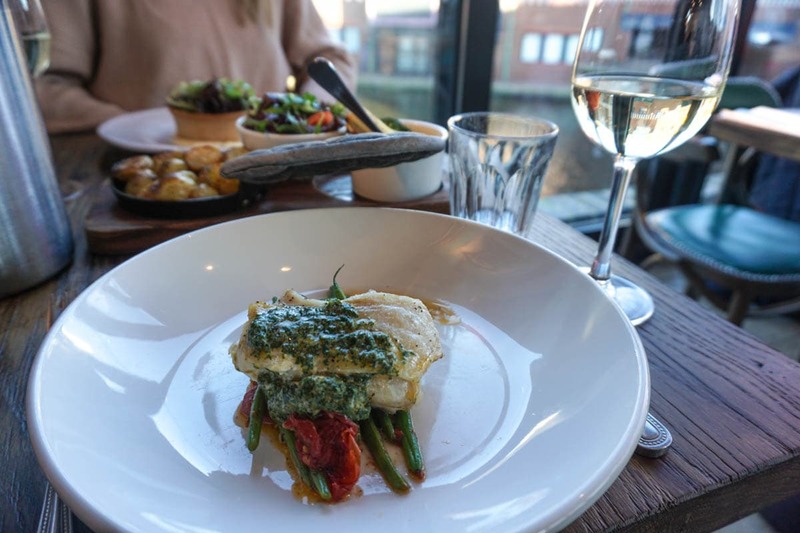 With a gorgeous location overlooking the canals, I’d definitely recommend this restaurant if you’re looking for a great lunch or dinner spot! 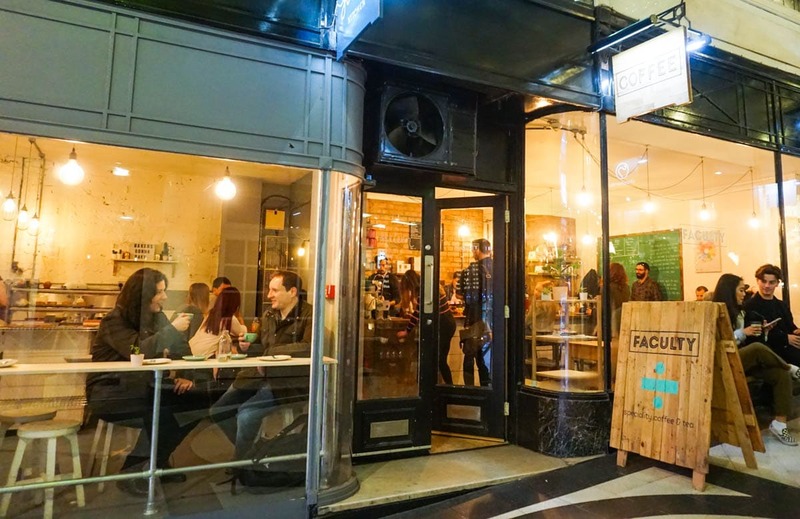 Tucked away in the Piccadilly Arcade is this cute coffee spot. Even on a busy Saturday in the city we managed to grab a wooden table and enjoy a caffeine fix in a chilled out environment. I also loved watching the team making sweet treats ready to sell in the café! Built in 2007, this is a new addition to Brum since I last visited. 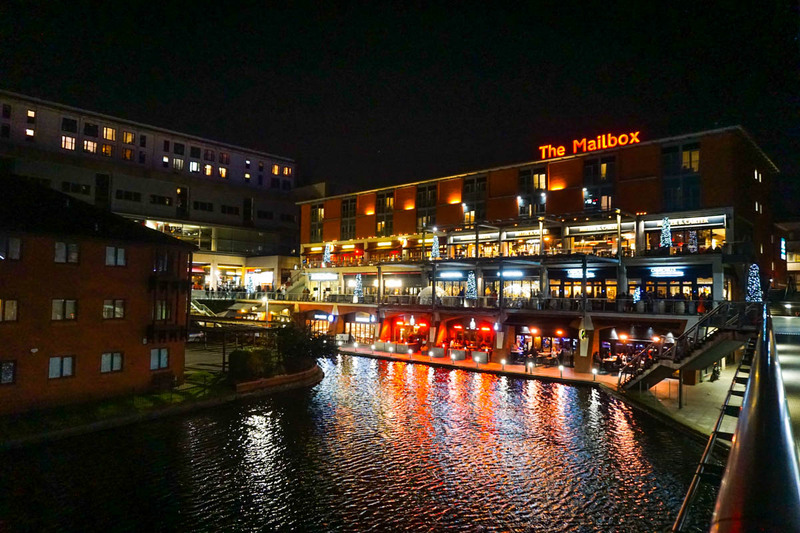 With a modern structure reminiscent of a gigantic Tetris game, The Cube is home to shops, a hotel and some great bars and restaurants. For a treat, visit floor 25 and pay a visit to Marco Pierre White’s Steakhouse Bar And Grill. 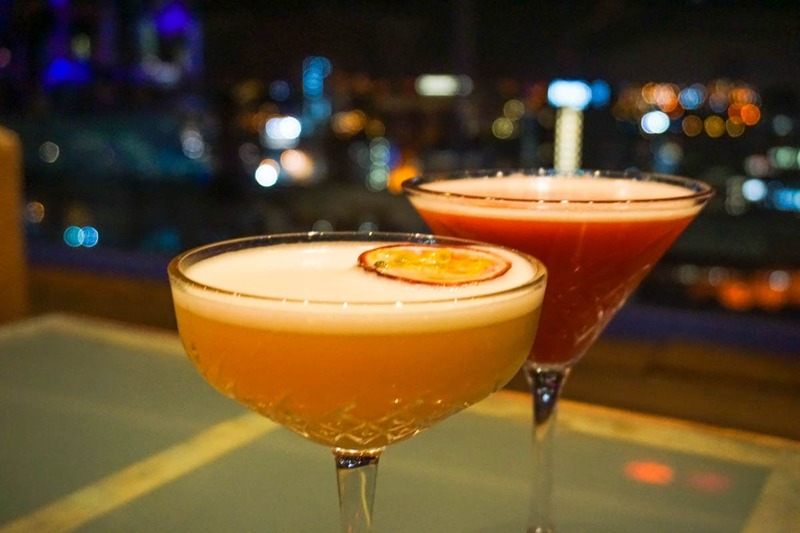 The cocktails are excellent, especially when accompanied by those panoramic views. On one of the outside terraces at The Mailbox is this smart bar, which serves a really fun menu of cocktails. Order a lava lamp and you’ll receive a drink that’s frothing and bubbling like a magic potion, with jelly bubbles running through it. It was great to see some classic flair tricks, with glasses being juggled, flipped and caught too. It was the perfect finish to a great weekend in the city. 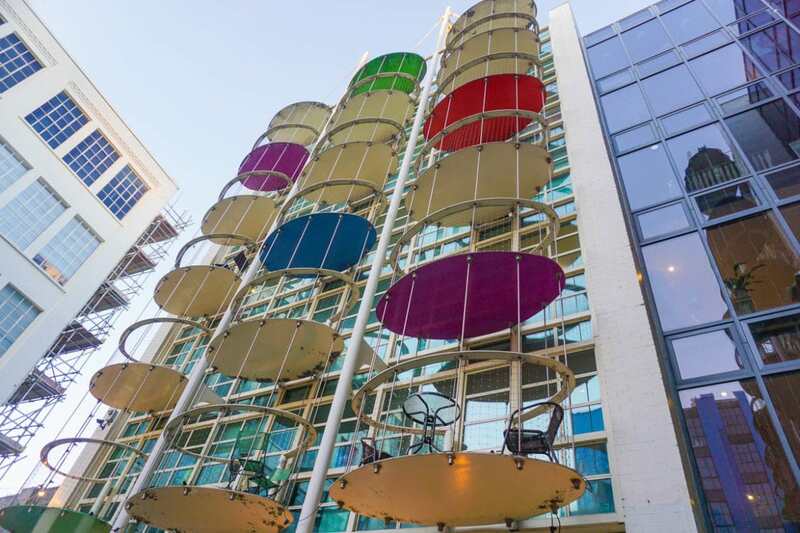 I stayed at the Radisson Blu Hotel right in Birmingham city centre. With great views, a top breakfast and a location perfect for a weekend of exploring, I’d definitely recommend it. 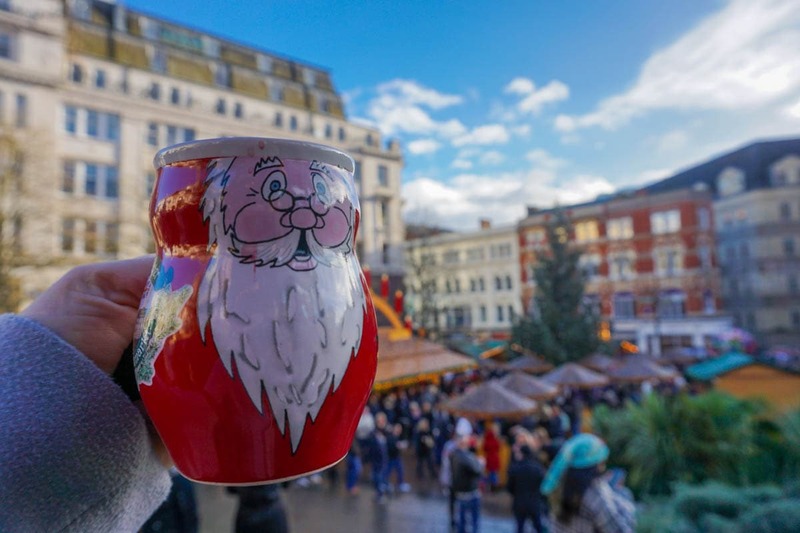 I visited Birmingham as part of my year as a Visit England ambassador, showing you some of the amazing things to do without jetting off to far off destinations. 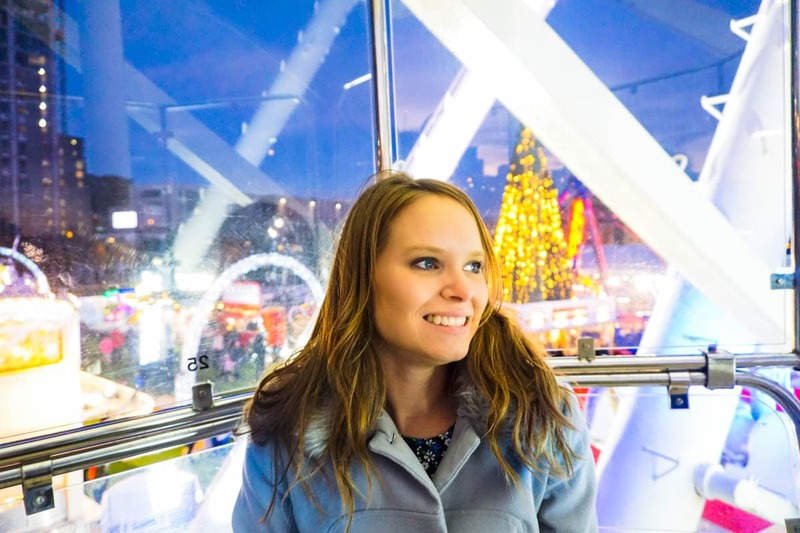 Check out my blog on Brighton if you haven’t already! A big thanks to Visit England and Visit Birmingham for organising my trip! If you’re looking for inspiration within our amazing country, check out the Join The World campaign here. As always, all opinions are my own.